Cozy & Hectic Family Rooms | Alcher Interiors, Inc.
Love the look of wood but have active kids and animals running wild? Maybe you’re concerned about using wood in a family space because of all the activity? We have a solution! Attic by Grazzini is a porcelain tile that simulates the wood look. I swear, it fooled me the first time I saw it! Now you can have that wood look with tile’s easy cleaning. So lay down the Black Rett Grazzini tile and consider a decorative border using stone and/or glass tile accents by Jeffrey Court or mosaics by Stone & Pewter Accents. Jeffrey Court serves up two glass and stone choices– a Pietra Opal 1 ½ X 1 ½ square Fire & Ice in Quartz and glass a random 1 ½ ” x 1 ½ ” and 1 ½ ” x 5 ½ ” mix of Brick shapes Fire & Ice in Quartz. Both of these offerings come on mesh-backed sheets approximately 11” square. 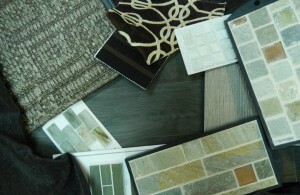 Stone & Pewter Accents gives you 3 different choices of glass mosaics. Check out the marbleized 1” x 1” squares in ivory silk, the Hasen 1” x 3” glass in argent or the Sumie Hida 1” x 2” in silk. For that extra warmth in your cozy family room, consider a heated floor under a sisal area rug from Fiberworks Studio Key Rug Collection in silvered gray! Add an interesting texture to your walls using Candice Olson’s Collective I grass cloth-look with just a slight hint of metallic in a beautiful neutral greige (gray/taupe mix). For upholstery options, Perennials’ Pygmy Stripe in basalt and Old World Weavers’ Interlochen in Chocolate Chip tie everything together for a polished, comfortable family room that can stand up to the traffic. All products mentioned in this post are 20% off for three weeks starting October 5, 2015 through October 23, 2015. Stop in and see what you can do!